$100 million we allocated to policyholders! The Trust Rewards Program sets up a “nest egg” for enrolled policyholders. Each year you renew your policy, funds will be set aside in your Trust Rewards account. The funds will be allocated to you at the time of retirement or other qualifying events. Think of it as our way of saying thank you for your loyalty to TMLT and commitment to the patients of Texas. Trust Rewards accounts are set up at no cost to you, and we fund the accounts annually. This year, $100 million has been allocated for policyholders. Quarterly statements will be mailed to enrolled physicians. What do I need to do to sign up? If you haven’t already enrolled, sign the enrollment form at www.tmlt.org/trustrewards Don’t forget to check the box that indicates you want to participate in the Trust Rewards Program. Now you can provide a complete allergy testing and immunotherapy service line. Your patients no longer have to suffer from seasonal allergies and you don’t have to risk losing them by referring out to specialists. By offering this service line, physicians are able to provide a higher level of care to a large portion of their patient base, while generating a new revenue stream. About United Allergy Services: •	We	hire	and	train	a	Certified	Clinical	Allergy	Specialist	to	test, educate and custom build immunotherapy under the supervision of the on-site physician. 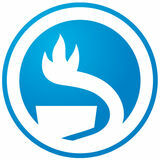 •	Provide	all	supplies	and	materials related to the service line. •	Focus	efforts	on	patient	safety,	patient compliance and patient outcomes. •	Allow	you	to	treat	allergy	patients	rather than cover their symptoms with medications. Interested in becoming a UAS Allergy Center? Visit	www.UnitedAllergyServices.com	or	call	888.50.ALLERGY. TAFP OFFICERS I. L. Balkcom IV, M.D. Now—right here in Texas—you have access to an even stronger source of medical professional liability protection and service. American Physicians Insurance (API) has increased its strength, combining forces with ProAssurance companies to become the fourth largest writer of medical professional liability insurance in the U.S. You receive unparalleled support, with enhanced risk management and claims resources. We are committed to treating you fairly, helping you to: • protect your important identity • lessen the uncertainty you face • increase the control you experience API ProAssurance From our base in Austin, YOU are our focus. to learn more about new services and products in the field, develop business relationships, and hear valuable information to improve your practice. While in the hall, stop by the research poster displays on Friday, and play the Treasure Hunt game to win a $100 gift certificate. Join your colleagues from across the state for TAFP’s special events including attendee favorites like Thursday’s Town Hall Meeting on Clinically Integrated Practice Models and the Members’ Reception Saturday afternoon. We present three new events this year: the Member Assembly Luncheon Friday midday, Leadership and Legislative Training Friday afternoon, and the TAFP Foundation Night of Jazz and Art Friday night. The star of the special events will surely be Saturday night’s President’s Party held at the Bob Bullock Texas State History Museum when we’ll welcome incoming TAFP president Troy Fiesinger, M.D., to his office. This year’s Annual Session and Scientific Assembly is designed just for you and we hope you have a wonderful time with your family medicine “family” in Austin. Thank you for being a part of our program. 8:45 a.m. - 12 p.m.
Friday, July 13, 2012 6:15 a.m. - 6 p.m.
12 - 1:30 p.m.	1 - 2 p.m.	1 - 2 p.m.
*NOTE: Invitation to events marked with an asterisk is limited. Visit the registration staff with questions. CME Schedule begins on page 9. One Conference, Two Locations All meetings and events held Wednesday will occur at the Hilton Austin Hotel. Thursday, all events except the CME seminars will be held at the Hilton; the seminars will be held at the Austin Convention Center, located one block south of the Hilton Austin Hotel. All CME events on Friday and Saturday will take place at the Austin Convention Center, and on Sunday, all events will be back at the Hilton Austin Hotel. Throughout the schedule printed in this year’s Official Program, “Hilton” will stand for the Hilton Austin Hotel, and “ACC” will indicate the Austin Convention Center. The Texas Academy of Family Physicians is accredited by the Accreditation Council for Continuing Medical Education (ACCME) to provide continuing medical education for physicians. The Texas Academy of Family Physicians designates this live activity for a maximum of 23 AMA PRA Category 1 Credit(s)™. Physicians should claim only the credit commensurate with the extent of their participation in the activity. The 63rd Annual Session and Scientific Assembly will provide family physicians and other health care professionals the opportunity to update their medical knowledge of important advances in the medical field, address their unmet educational needs, enhance their clinical skills, and support professional development through a multi-faceted curriculum. Through didactic lectures, case-study discussions, and audience interaction, this activity strives to develop and promote CME with the ultimate goal of enhancing patient care. The Texas Academy of Family Physicians adheres to the ACCME standards regarding industry support of CME and disclosure of faculty and commercial support relationships, if any, will be made known during the conference. 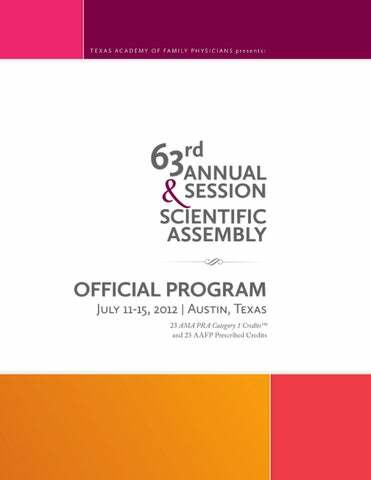 This Live activity, 63rd Annual Session and Scientific Assembly with a beginning date of July 11, 2012, has been reviewed and is acceptable for up to 23.0 Prescribed credits by the American Academy of Family Physicians. Physicians should claim only the credit commensurate with the extent of their participation in the activity. This course has been designated by the TAFP for up to 1 hour of credit in ethics and/or professional responsibility. The material presented in all sessions is offered solely for educational purposes. TAFP disclaims any and all claims that may result from use of information presented in this activity. Material contained herein may be graphic but is intended for clinical use. It is the policy of TAFP that all CME planning committee members, TAFP staff, and speakers disclose relationships with commercial entities. Disclosure documents are reviewed for potential conflicts of interest and, if a conflict is identified, it is resolved prior to confirmation of participation. Only those participants who have no conflict of interest or who agree to an identified-resolution process prior to their participation were involved in this CME activity. *	The SAM Workshops are limited to those who registered to attend. **	These meetings are limited to the members of the board and committee, respectively. Separate $200 registration fee required. ABFM diplomates will earn credit for the Self-Assessment Module of their Maintenance of Certification through the SAM Group Study Workshop on Diabetes and the SAM Group Study Workshop on Childhood Illness. They will discuss and complete the 60-question Knowledge Assessment portion of the module presented by TAFP and moderated by Linda Siy, M.D., and Rebecca Hart, M.D., respectively. Attendees will be eligible to complete the Clinical Simulation online after the conference. Participants will receive credit if they are currently eligible and enrolled in the ABFM MC-FP process, have not completed the current MC-FP stage, have paid the MC-FP fees to the ABFM prior to completing the Clinical Simulation, have completed the Clinical Simulation, and have attended and fully participated in the educational discussion for the entire session. NP I S a in n will Jan An be ua ton in ry io 20 13! This year, NPI is offering more than 80 CME seminars at many locations, covering a full range of office procedures, hospital procedures and emergency room procedures. Known nationwide as the premier provider of CME procedures training, over 45,000 clinicians have trained with NPI. Visit the NPI Web site for a complete schedule of seminars and start getting more out of your practice today! 1-866-NPI-CME1 (1-866-674-2631) | www.npinstitute.com Attention AAFP members: You can generate income for your state chapter of AAFP by attending an NPI conference! Just type the name of your state in the “Referral Code” field when registering online and NPI will pay your state chapter $50. NPI courses are approved for prescribed credit by the American Academy of Family Physicians.Visit the NPI website for specific course credit information. NPI is a joint venture of the American Academy of Family Physicians, Society of Teachers of Family Medicine and the Texas Academy of Family Physicians. NPI is a joint venture of the American Academy of Family Physicians, Society of Teachers of Family Medicine and the Texas Academy of Family Physicians. Thursday, July 12 7 - 11 a.m.
*	Included in Annual Session registration; no RSVP necessary. 3. Use a simple coding tool that makes seemingly complex chart documentation guidelines simple. 4. Discuss implementation goals, impact to your practice, differences between ICD-9-CM and ICD-10-CM code sets, and educational needs for ICD-10-CM. 2 - 5 p.m.
CME Schedule for Thursday 2 - 5 p.m.
By the end of this activity, the participant should be better able to: 1. Utilize chart documentation guidelines to optimize correct coding and reimbursement. 2. Discuss how third-party auditors look at medical charts from a reimbursement perspective. By the end of this activity, the participant should be better able to: 1. Discuss nonsurgical approaches to obesity and weight loss, the diet and exercise prescription. 2. Discuss various options available and evidence for their efficacy, including various diets and diet programs. 3. Discuss what to do to get patients motivated and to the point of making a permanent change in eating styles, and how to help them incorporate exercise into their lives. 4. Identify patients who are good candidates for bariatric surgery and what premorbid conditions are exacerbated by obesity and improved with surgery. Thursday Special Events 5. Decide what preoperative evaluation and/or interventions are needed before patients are scheduled for surgery. 6.	Review bariatric procedures, including what is being done and how well it works. 7. Discuss postoperative care of the bariatric patient, including issues such as vitamin malabsorption, chronic need for vitamin supplements, issues with postoperative pill size, not drinking liquids with meals, and what foods can be problematic. 2 - 5 p.m.
Council of Past Presidents Luncheon 12 - 1:30 p.m. • Hilton Room 415 TAFP’s past presidents will reminisce about the past and discuss the future of family medicine. This event is complimentary and open to TAFP’s past presidents only. TAFP reception sponsored by the UNTHSC Faculty Development Center 6 - 7 p.m. • Hilton Room 406 Join us for a reception to celebrate the opening of the University of North Texas Health Science Center Faculty Development Center in Fort Worth. This event is free and open to all members. By the end of this activity, the participant should be better able to: 1. Recognize various pediatric disorders. 2. Establish the differential diagnosis for various pediatric disorders. 3. Determine the management of various pediatric disorders. Panel Discussion and Town Hall Meeting on Clinically Integrated Practice Models 7 - 10 p.m. • Hilton Salon B Various clinically integrated practice models are being developed in communities across the state that could help sustain family medicine practices and prepare them for future health care delivery system changes. Come and hear from three of your colleagues about models with which they are involved. All participants are welcome to attend. Best Practices for Improved COPD Care Hobart Lee, M.D. Dementia After the Diagnosis: Helping the Patient and Family Cope Dale Moquist, M.D. Abnormal Uterine Bleeding Rebecca Hart, M.D. Hypothyroidism: Treating to Optimal Levels Sharon Hausman-Cohen, M.D. CME Schedule for Friday 8 - 8:45 a.m. 8:45 - 9:45 a.m. 9:45 - 10:30 a.m.
10:30 - 11:30 a.m. Imaging: Choosing the Appropriate Exam Robert Milman, M.D. 11:30 - 11:45 a.m.
Friday Special Events Breakfast with Exhibitors in the Exhibit Hall 6:30 - 7:45 a.m. • ACC Exhibit Hall 1 This is where it all begins! In the Exhibit Hall, you can learn about new products and services in the health care field, interact with professionals in all facets of health care, and receive valuable information on the latest advancements in medicine. Over 50 exhibitors from the medical industry will be on hand. The TAFP Foundation’s Board of Trustees will serve breakfast and answer your questions about the Foundation’s activities. The Exhibit Hall is located in Exhibit Hall 1 at the Austin Convention Center. Student, Resident, and Community Physician Research Poster Competition 8 a.m. - 4 p.m. • ACC Exhibit Hall 1 Encourage family medicine research as students, residents, and community physicians display the latest in research and teaching through poster-panel displays in three categories: primary research, case report, and evidence-based review. Awards will be given in various categories. Treasure Hunt in the Exhibit Hall 9:45 - 10:30 a.m., 1 - 1:30 p.m., 3:30 - 4 p.m. ACC Exhibit Hall 1 While enjoying dedicated breaks inside the Exhibit Hall, take part in our Treasure Hunt and find the booths displaying lighted guitars. Write them down on your bright blue Treasure Hunt game card and turn it in at the registration desk on Friday or Saturday. You could win a $100 gift card! Join your colleagues to hear from TAFP volunteer leaders and have an opportunity to provide your feedback. TAFP officers will give an update on what the Academy is doing for you and commission chairs will talk about the work of each of their commissions. You’ll learn more about how you can get involved and you’ll have an opportunity to tell us what you think! Leadership and Legislative Training 1 - 5 p.m. • ACC Room 6 Attendees of the Leadership and Legislative Training will hear renowned policy experts give an overview of the primary care workforce, and present demographic, geographic, and policy challenges under consideration by our elected officials. Receive instruction from top-notch grassroots consultants who will provide practical advice on how you can advance the cause in your home district. TAFP Foundation Event: A Night of Jazz and Art 8 - 10 p.m. • Hilton Salon A The TAFP Foundation presents an evening of jazz and art featuring TAFP leader Tricia Elliott, M.D., accompanied by the Austin Kimble Trio. Art will be displayed for viewing and purchase, with proceeds benefiting the TAFP Foundation. Tickets may still be available; check with staff at the TAFP registration desk. Saturday, July 14 6:15 a.m. - 6:15 p.m. Registration Open ACC Exhibit Hall 1 Lobby 8:45 a.m. - 12 p.m.
11:30 a.m. - 12 p.m. Final Exhibit Break 12 - 1:45 p.m.
Office Management of Wounds Jayesh Shah, M.D. Identifying and Treating Palpitations and Arrhythmias J. David Burkhardt, M.D. Sorting Out Different Types of Tremor Kameel Karkar, M.D. 9:30 - 10:30 a.m. Headaches in Primary Care Michael Ready, M.D. 10:30 - 11:30 a.m. Painful Joints: When to Treat, When to Inject Christopher Parker, D.O. President’s Party 7 - 10 p.m.
Saturday Special Events Treasure Hunt in the Exhibit Hall 8:45 - 9:30 a.m., 11:30 a.m. - 12 p.m. • ACC Exhibit Hall 1 Find the booths displaying lighted guitars, write them down on your bright blue Treasure Hunt game card, and turn it in at the registration desk. You could win a $100 gift card! TAFP Business and Awards Lunch 12 - 1:45 p.m. • ACC Ballroom B/C Join TAFP President I. L. Balkcom IV, M.D., and help him applaud this year’s honorees of the Physician of the Year, Physician Emeritus, and other awards. Also see the 2012-2013 TAFP officer installation. This event is open to all conference attendees and TAFP members. Members’ Reception 5:30 - 6:45 p.m. • Hilton Room 408 TAFP welcomes all members—especially new physicians, special constituency physicians, students, residents, and the 2012 TAFP award recipients—to meet and mingle with the family medicine family. Celebrate the spirit of Texas at this year’s President’s Party, held at the Bob Bullock Texas State History Museum. Enjoy a buffet dinner exploring the flavors of Texas regions, live music from Austin’s own country music singer-songwriter Kelly Willis, and tours of the first floor of the museum. Join us and extend congratulatory sentiment for outgoing president I. L. Balkcom IV, M.D., and incoming president Troy Fiesinger, M.D. Shuttle service to the Bob Bullock museum will be available beginning at 6:55 p.m. Pick up is located on the corner of 5th and Red River, near Java Jive on the lobby level of the Hilton Austin. Return transportation to the Hilton Austin will be provided through the end of the event. Adults, children over age 13: $40 • Children (12 and under): $20 Special thanks to Texas Medical Liability Trust for their support of this year’s President’s Party. Sunday, July 15 6:30 a.m. - 12:15 p.m.
9:30 - 10:30 a.m. AAFP Update Glen Stream, M.D., M.B.I. 10:30 - 11:30 a.m. Strategies for Cost Effective Care Richard Young, M.D. Ethics: Withdrawal of Care Issues in a Hospice Patient Ronald Crossno, M.D. where your work makes a difference! Exciting and challenging job opportunities await you at a state supported living center. tate supported living centers, located across Texas, provide 24-hour residential care for people with intellectual and developmental disabilities. Make sure you have the right insurance to help you protect the life you’ve worked so hard to build. 1. Insurance Information Institute. “Changes in Your Life Can Mean Changes in Your Insurance, Says the I.I.I.,” Press Release, January 22, 2007. Wi-Fi: How Do I Connect? At the Hilton Austin, you can get complimentary wireless access in the hotel lobby, and in hotel restaurants and lounges. Internet is available for purchase inside your hotel sleeping room. Access is not available in the Hilton Austin or Austin Convention Center meeting rooms. Things to do in Austin Surrounded by Central Texas’ rolling hills with Lady Bird Lake running through the city, Austin is a haven for outdoor enthusiasts. Enjoy a scenic stroll or cycle along the Lady Bird Lake Hike and Bike Trail, covering more than 10 miles. Try water activities on the lake by renting a kayak or paddle board. Picnic at Zilker Park and swim at Barton Springs Pool, and stay to watch the free Zilker Summer Musical production of the Sound of Music in the evening. Observe city-meets-nature as Austin’s resident bats fly from under the Congress Street Bridge at dusk. Many Austin attractions are minutes from the hotel including the Texas State Capitol Building, the Bob Bullock Texas State History Museum, the Blanton Museum, the Austin Children’s Museum, South Congress shopping, and the up-and-coming 2nd Street District. Questions? Ask the concierge or stop in to the Austin Convention and Visitors Bureau, located at 301 Congress Avenue, Ste. 200. Or call 800-926-2282 or go to www. austintexas.org. Navigating downtown Unlike the rest of the city, it’s easy to get around downtown! It’s set up as a grid with numbered streets starting at Cesar Chavez/1st Street, parallel to Lady Bird Lake, increasing numerically as you travel north. As a frame of reference, the Texas Capitol sits between 11th and 15th, and forms a T with Congress Avenue, dividing the downtown east-west streets. The east-west streets are named for the Texas rivers from south to north, so if you know your Texas geography, you can start at Rio Grande Street west of downtown and work your way east past Nueces, San Antonio, Lavaca, Colorado, Brazos, San Jacinto, Trinity, and Neches to Red River Street. If you need to venture farther from the hotel, cabs are available at the entrance of the hotel. To return, call Austin Cab Company at (512) 478-2222 (credit cards accepted and preferred) or Yellow Cab Austin at (512) 452-9999. For local running tips and more information on fitness options, visit the concierge desk. Glen Stream, M.D., M.B.I. President, American Academy of Family Physicians Family Physician, Rockwood Clinic Spokane, Wash.
Hobart Lee, M.D. Associate Program Director, Family Medicine Residency, Loma Linda University Loma Linda, Calif.
To welcome you to our hometown, the TAFP staff compiled a list of our favorite downtown restaurants. From elegant to home cookin’, there’s something for everyone! You can read each staff member’s recommendation on our blog at www. tafp.org/blog, but here’s a quick list of our picks. The three goals of the TAFP Foundation are to support family medicine research, encourage medical students to choose family medicine, and support family medicine residents. We need your help to meet our mission. Help the TAFP Foundation by offering a tax-deductible donation. You can donate at the Annual Session registration desk. The TAFP Foundation presents an evening of jazz and art featuring TAFP leader Tricia Elliott, M.D., accompanied by the Austin Kimble Trio. Art will be displayed for viewing and purchase, with proceeds benefiting the TAFP Foundation. Tickets may still be available; check with staff at the TAFP registration desk. Foundation Board members will be in the Exhibit Hall Friday morning serving breakfast, answering questions, and thanking you for your support. This is an opportunity to meet your colleagues who support the TAFP Foundation. Get a Massage and Support the Foundation The TAFP Foundation will offer 15-minute chair massages and 60-minute full-body massages during Annual Session. The chair massages will be given in Booth 213 inside TAFP’s Exhibit Hall at the Austin Convention Center and the full-body massages will be given in Room 402 at the Hilton. A 15-minute massage is $20 and a 60-minute full-body massage is $75, with 50 percent of the proceeds benefiting the TAFP Foundation. Massages are available by appointment only from 10 a.m. - 4 p.m. on Friday and from 9 a.m. 12 p.m. on Saturday. Cash only. Interested attendees can sign up at the massage booth. They will be given a ticket confirming their time slot and payment. That ticket will then be presented to the massage therapist at the booth or the hotel at the assigned time. TAFP Foundation VIPs Annual Session registrants were able to make a donation to upgrade their General Session seating to VIP status on the Annual Session registration form. In return for this special donation, they will receive reserved seating in the CME classroom, along with other exclusive perks. The TAFP Foundation extends a special thanks to this year’s VIP donors. The Physicians with Heart Program, an annual service project occurring in conjunction with TAFP’s Annual Session and Scientific Assembly, brings together the resources of 7,000 family physicians, family medicine residents, and medical students to benefit a designated clinic in the Annual Session host city. The program is sponsored by the Section on Special Constituencies and supported by the TAFP Foundation. This year’s donations will benefit the People’s Community Clinic, a non-profit primary health care facility in Austin. Bring your Physicians With Heart donation to the registration desk for TAFP staff to collect. All donations will be given to the People’s Community Clinic after the conference. For more information, go to www.tafp.org/membership/giving-back/ physicians-with-heart. Free CME credits. Available 24/7. Now you can choose the time and place to take the courses you need and want. We’ve made it easy to take free CME courses online. We offer 24/7 access to more than 40 courses, including when to refer to a pediatric specialist. And even when you’re not taking a course, you can access the latest references and resources you need. School Office of Continuing Dental Education, Texas Dietetic Association, Texas Academy of Audiology, and International Board of Lactation Consultant Examiners. Continuing Education for multiple disciplines will be provided for these events. To view courses online, visit www.txhealthsteps.com.